LGBT groups criticized the U.S. Senate on Saturday for confirming Brett M. Kavanaugh to the Supreme Court after a bitter nomination fight. Soon after senators voted 50-48 mostly along party lines, Kavanaugh was sworn in by Chief Justice John G. Roberts, Jr. and the retired Justice Anthony M. Kennedy, whom Kavanaugh will replace. The swearing in ceremony took place in private. Kavanaugh's nomination was clouded by accusations of sexual misconduct. He also lashed out at Democratic senators during a Senate hearing on the allegations, leading some to say he lacked the temperament to sit on the nation's highest court. A chorus of women shouting “Shame!” were removed from the Senate gallery as Senators voted. Other protests took place on the steps of the Supreme Court and the Capitol. President Donald Trump cheered the news. “He's going to go down as a totally brilliant Supreme Court justice for many years,” he told reporters. LGBT groups disagreed, saying that Kavanaugh was unqualified for the lifetime appointment. Griffin added that Kavanaugh's confirmation would activate Democrats in November. “In the wake of this news, there is only one course of action. The millions of Americans who have fought a valiant struggle against this Trump-Pence nominee must make their voices heard in November and beyond by electing lawmakers who will stand up for our rights rather than sell us out,” Griffin said. LGBT law group GLAD said that serious questions remain about Kavanaugh's qualifications. “Serious questions remain about both the thoroughness of this process, and about Judge Kavanaugh’s ability to credibly respond to multiple allegations brought forward against him. 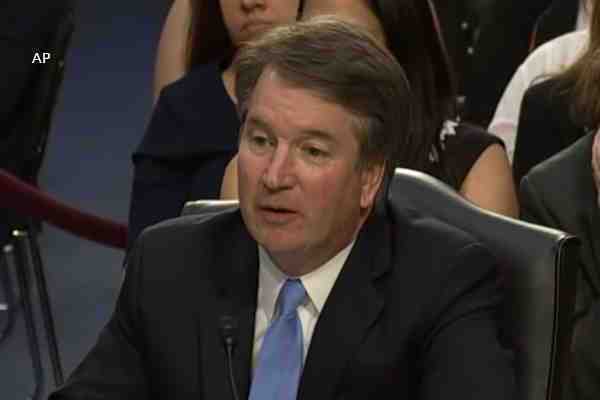 In his testimony last Thursday he failed to demonstrate the steady and independent judicial temperament Americans have a right to expect from any judge, most especially a justice of the Supreme Court,” said GLAD Executive Director Jason Wu. “Kavanaugh's belligerence and hyperpartisan attacks at last week's hearing demonstrates that he does not have the temperament or impartiality for a lifetime appointment to our nation's highest court,” Minter added. Kavanaugh will take his place on the bench on Tuesday.